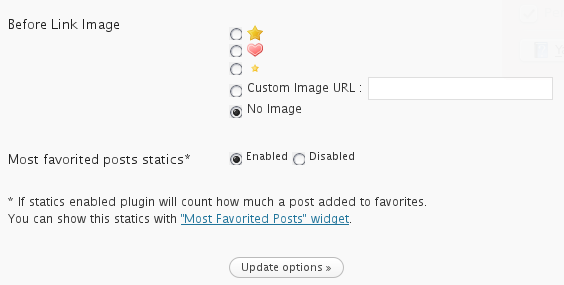 “Before Link Image” feature coming with next version of WP Favorite Posts plugin. This entry was posted in WordPress and tagged coming soon, new feature, wp favorite posts on 08 June 2009 by Huseyin Berberoglu. Hey, there was a problem with my Feedburner rss. It’s URL was wrong. I corrected url so you can follow this blog via this rss feed. This entry was posted in General and tagged follow me, Meta on 03 June 2009 by Huseyin Berberoglu. WP Favorite Posts 1.3 Released ! Fixed bug: Plugin was working wrong in pages with links includes # character. Added template tag for Most Favorite Posts. There was already a widget for this. The parameter for limiting post count of list. Default value is 5 posts. This entry was posted in WordPress and tagged my plugins, new release, wordpress plugins, wp favorite posts on 31 May 2009 by Huseyin Berberoglu. Welcome to my new blog. This is the second blog i have. I was writing about my thoughts, ideas, code samples and other things already at birazkisisel.com. I was writing in Turkish but when i create a plugin named wp favorite posts i need to write anouncements in English for it. So i made this blog for sharing my stuff in English. If you want to follow this blog you can use this RSS feed. Thanks for following. This entry was posted in General and tagged hello on 14 May 2009 by Huseyin Berberoglu.